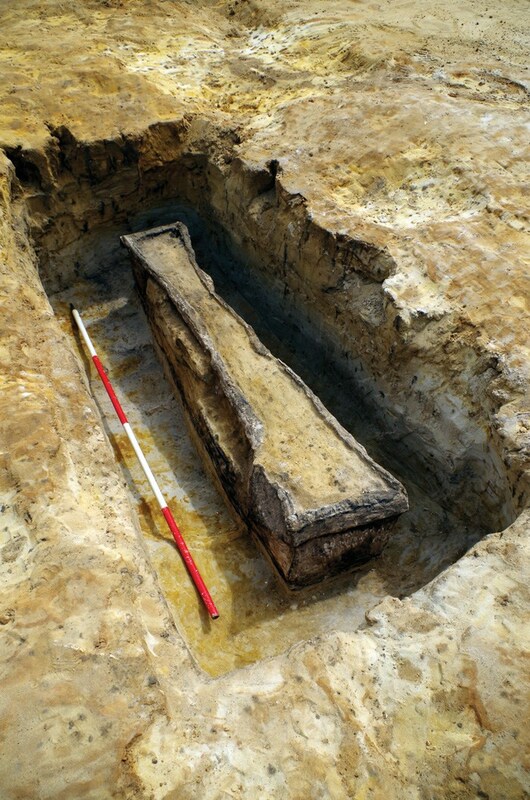 Archaeologists excavating a quarry in Surrey have unearthed two Roman-era lead coffins. Lead coffins are rare — only a few hundred have ever been discovered in Britain — and these are even rarer that usual because they are decorated. The coffins formed part of a group of burials that lay within a small L-shaped cemetery enclosure. Aligned east to west, the caskets were each of similar size, measuring 1.9m long by 0.45m wide and 0.36m high [6’3″ x 1’6″ x 1’2″]. Staining of the soil within the grave fill suggests that they may have originally been encased in larger wooden coffins – something that ongoing scientific analysis is hoped to confirm. Both coffins were made from soldered sheets of cast lead, and their lids were decorated with images of scallop shells set within triangles and rectangles formed from beaded straps. Scallop motifs are common decorations on the lids of Roman lead coffins, particularly on those found in the Thames Valley area. It is believed that they were associated with the Roman idea of the journey to the underworld, but in the Romano-Celtic culture, it may also refer to fertility and rebirth. The remains they contain are not in good condition. The coffins’ lids collapsed over time and sand filled the space. The skeletal remains that have survived indicate one of the coffins contained an adult and an infant less than six months old. The other coffin contained an adult. The Wessex Archaeology team has discovered four more burials in the quarry. They didn’t have lead coffins, but they did have wood ones. Some remnants of the wood from the coffins were found in three of the four graves. Iron nails survive from the fourth coffin which has disintegrated.